Just like with their SATA drives, people require easy removability of a PCIe drive for security or transport. After all, faster speeds and new technology don’t eliminate the basic need for data security or to efficiently move large amounts of data. 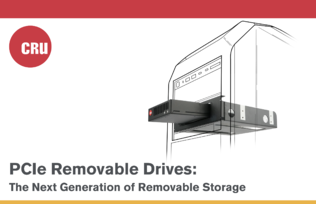 And as regular removal/insertion cycles become part of their PCIe SSD workflows, people want to protect the drive as it is handled, moved, and shipped. Today, CRU already has its first removable PCIe drive on the market, with native PCIe connectivity for the highest of throughput and read/write speeds. CRU’s PCIe removable is called the Data Express QX310 and is built for years of use with the same rugged characteristics as all of our other removable drives. Along with its durable componentry, the QX310 accommodates either M.2 or U.2 form factors. SATA hard disk drives and SSDs are going to be with us for a long time, but as users and the industry begins to shift, we are ready. To find out more, check out this ebook. This entry was posted in Customers, Technical Tips, Data Backup, Removeable Drive, Data Security by CRU. Bookmark the permalink.